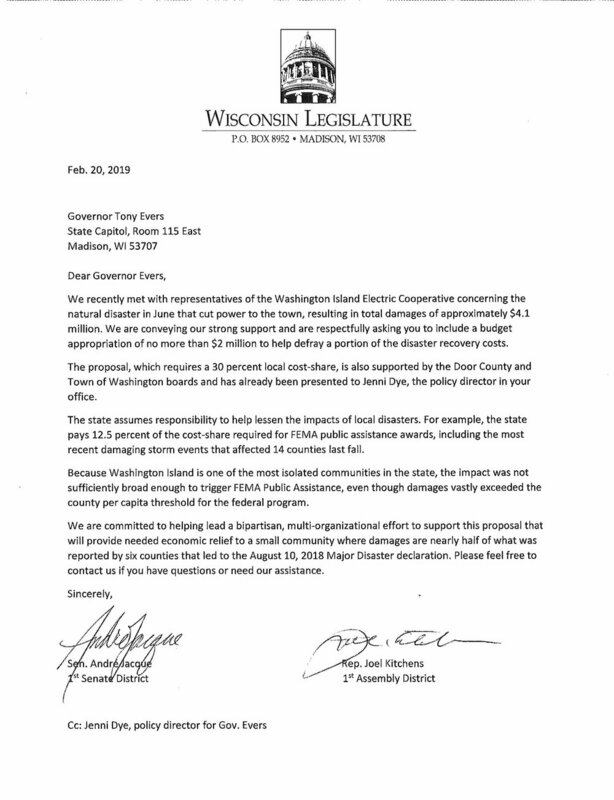 The Governor recommends providing funding on a one-time basis to the Wisconsin Disaster Assistance program for costs related to the replacement of the cable that brings electricity to Washington Island. This allocates up to $1,000,000 per year for each of the two budget years but, as you know, is only the first step. Now our efforts turn to keeping this provision in whatever becomes the final budget. To thank our representatives for their support and to reinforce the importance of our issue, we asked you to send postcards to them. This was very successful and both representatives expressed their appreciation for the effort. If you have not sent them the postcards we sent you, you can still do so. They indicated that more are arriving each day. 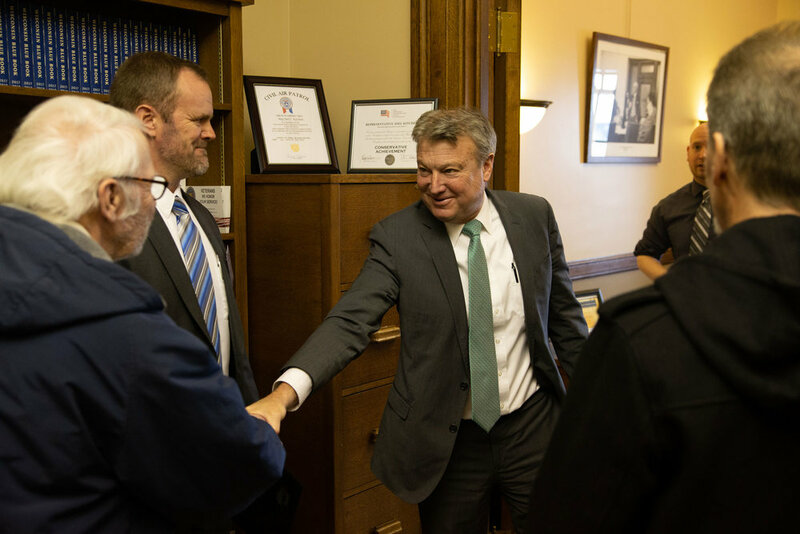 In conjunction with the Wisconsin Electric Cooperative Association’s Education and Lobby Day Event, Orion Mann, Hoyt Purinton, Lee Engstrom and Robert Cornell, met again with Senator Jacque and Representative Kitchens who expressed their continued support for our efforts. Senator Jacque was not in Madison at the time, but took time out of his schedule to attend the meeting by phone with his staff attending in person. Representative Kitchens was in Madison and met with us personally. As part of this program, representatives of all the electric cooperatives in the state were addressed by Jenni Dye, Chief Policy Director for Governor Tony Evers and part of her address expressed the Governor’s support for our efforts. At our initial meeting with her, we gave her a small section of the new cable and she said that it was one of the most talked about items on display in her office. We were also addressed by Senator Howard Marklein who is on the Joint Committee on finance and the Chair of Senate Committee on Revenue, Financial Institutions and Rural Issues. He expressed personal support for our issue and pledged to help shepherd it through the Joint Finance process. Representative Amy Loudenbeck, who is the Vice Chair of the Joint Committee on Finance, also expressed her support after speaking to our group. All 24 electric cooperatives attending this event supported our efforts by lobbying with their individual Representatives and Senators and their staffs at the Capitol later that morning. We have excellent support and are very grateful for the efforts they have made on our behalf. The budget is now in the hands of the Joint Committee on Finance in the legislature. 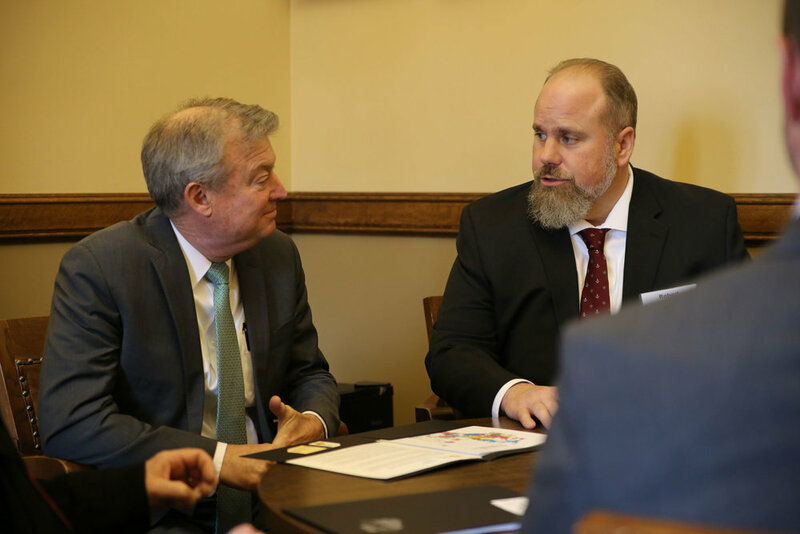 With the help of WECA, discussions will be held with Senator Darling and Representative Nygren who co-chair this committee. This committee will be holding 4 hearings in the state and will be accepting email comments on the budget. It would be helpful to our cause if you were able to either attend one of these hearings or send an email or written comment to them in support of our issue. The Co-Chairs also released the following statement regarding the public hearings: "We highly encourage the public to attend these public hearings. Hearing comments, concerns, and opinions from Wisconsin citizens is key for us to craft the best possible budget for our state." Governor: Provide one-time funding of $1,000,000 in 2019-20 and $1,000,000 in 2020-21 to the Washington Island Electric Cooperative utility from the state disaster assistance program for costs related to the replacement of the cable that brings electricity to Washington Island. 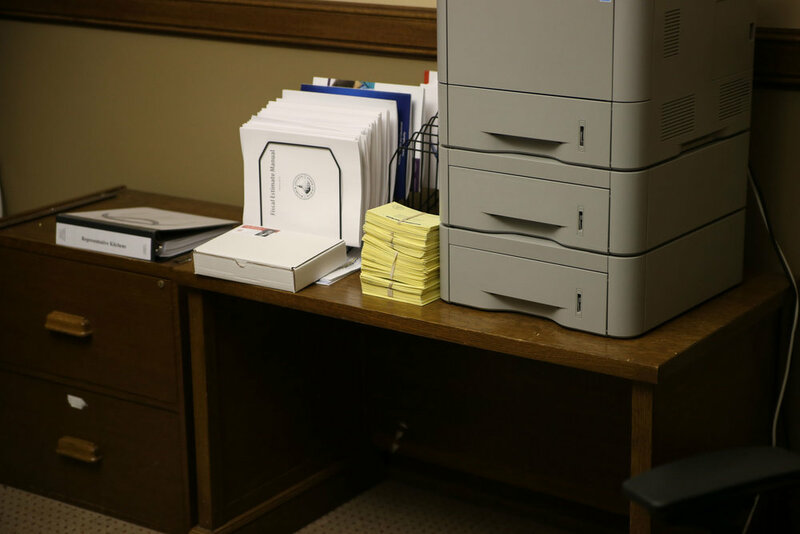 The state disaster assistance program makes payments to local units of government for governmental damages and costs incurred as the result of a major catastrophe. Funding would be provided from the petroleum inspection fund. As we have noted before, we have had a whole lot of support regarding this issue. Nothing is certain, and we cannot cash any checks yet, but things are positive and we hope they will stay that way. More to come.